workers’ participation in the public limited liability company and the SE. 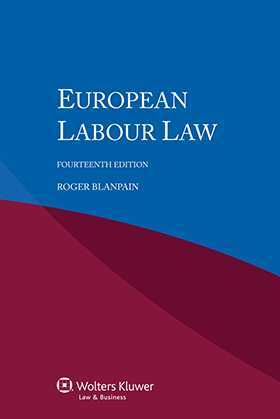 Recognizing the impact of the EU on labour law and especially the crucial role of the European Court of Justice, the Fourteenth Edition updates the book’s case law regarding such important issues as free movement of labour, freedom of services, and equal treatment. It also surveys the possibilities for European-wide collective agreements, as the social dialogue is evaluated against the background of European social realities. A comprehensive general introduction details how the Community institutions affect labour law, focusing on the legislative process in the EU and its relationship to other international organizations, especially the ILO. Special attention is given to the role of the European social partners – Business Europe, CEEP, UEAPME and the ETUC. In this context the author also elucidates the role of such organs as the Economic and Social Committee and the European Social Fund. As in previous editions, the Fourteenth Edition includes such user-friendly features as appendices presenting primary texts, a bibliography, an alphabetical list of cited cases from the European Court of Justice, and an index. General Introduction. Chapter 1. The Institutional Framework. Chapter 2. The Social Partners. Chapter 3. Competences of the EU Regarding Labour Law. Chapter 4. European Labour Law: Trailer or Locomotive? Part I. Individual Labour Law. Chapter 1. The Free Movement of Workers. Chapter 2. Freedom of Services. Chapter 3. International Private Labour Law. Chapter 4. Individual Employment Contracts. Chapter 5. Child Care and the Protection of Young People at Work. Chapter 6. Equal treatment. Chapter 7. Protection of Motherhood. Chapter 8. Working Time, Sunday Rest, Night Work and Parental Leave. Chapter 9. Safety and Health. Chapter 10. Restructuring of Enterprises. Part II. Collective Labour Law. Chapter 1. Collective Bargaining. Chapter 2. Workers’ Participation. Epilogue: In Search of European Social Model (ESM): A Dream? Appendices: Appendix 1. Community Charter on the Fundamental Social Rights of Workers (1989). Appendix 2. Cooperation Agreement between UNICE and UEAPME of 12 November 1998. Appendix 3. Charter of Fundamental Rights of the European Union (7 December 2000). Selected Bibliography. Alphabetical List of Cited Cases of the European Court of Justice. Index.